this is the correct date.the best concert ever...Rick Wakeman used Larry Cullies Hammond that night. I was in a band called HOT CITY,Later known as FANTASIA. WE owe much to that one night in the pit.I still have my 4001 Rickenbacker, just like Chris Sqires. Still play progressive YES type Oringinal music. I still live in DeLand. The concert in DeLand Fla. at Stetson University is probably one of the more interesting venues Yes has played. As the picture shows, the concert took place in a "sink-hole" that had a stage built at the bottom. This �sink-hole� � known as the �Pit� was located in the middle of the university's fraternity row. The promoter of the concert was the university fraternity concert committee. It was a free show to the public. The university committee had already brought several noteworthy "regional bands" to perform there but the Yes concert, planned for almost a year in advance, was the first "big-time" concert for that little stage and as such was talked about and hyped for months. I was 15 at the time and had only heard of the group via the hype surrounding this up- coming concert. Some of my high school friends knew, or thought they knew, bits and pieces about the band, so the misinformation ran pretty wild. I did hear their single - Your Move/All Good People on the radio just before they arrived so I had an idea of what to expect. I was a member of the high school�s marching band and the night of the concert we were rehearsing for our homecoming football game. These rehearsals had never gone past 9:00 pm, but on this particular evening the director kept us until 10:30pm. For those of us who were going to the show right after the rehearsal were dying inside with anticipation. As soon as we finished, we jumped into a friend�s car and sped (at 80 mph) through the residential streets to the Pit. When we arrived, the band was in the middle of "Your Move". The remainder of the concert for me was pure inspiration. I had not seen, until that evening, rock musicians playing at that level. They really messed with my adolescent head. The music was hypnotic. I�ve been a huge fan ever since. In an earlier post, I mentioned that Yes had performed �South Side of the Sky�. I believe now that I was incorrect. The Set list posted is basically correct. I don�t remember Wakeman doing a keyboard solo, and I remember Steve Howe playing a long, wonderful version of �Classical Gas� on solo guitar. I believe he may have done that knowing that his audience that night would not yet be familiar with either �Clap� or �Mood for a Day�. The stage was so small Rick Wakeman was all the way off stage left on risers and completely out of the lights - with his long blond hair we thought he might be a female (some of the misinformation I mentioned). The seating was on the ground, rising up like a mini-mini version of the Acropolis. Seating was maybe 400, and people were packed in like sardines. My friends and I felt like we had been part of something really special that night. It was my first year at Stetson and I was a brother of Sigma Phi Epsilon fraternity. 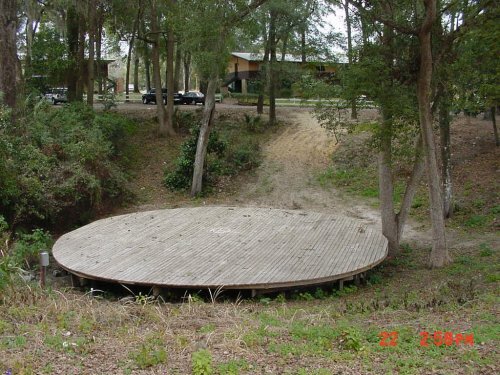 The fraternity house is the closest to "The Pit" and the trail (if you want to call it that) down to the stage. This is 1971 remember, so drugs were fairly prevalent. Anyway, another brother and I did some windowpane early in the afternoon on Sunday and when the band arrived we played soccer with them and the roadies on the small road around the circle. A little later, before it got dark, we helped the roadies' put lights and speakers in the trees (where else). Ok, it was getting strange at this point. My friend was holding one side of the ladder and I was holding the other while the roadie climbed up, the ladder started waving and he disappeared. That was the worst of it. We just looked at each other and said we better sit down. Ok, we had the best spot on the ground amphitheater style small arena. We were about 10 feet front and center. The crowd was pretty cool with joints being passed around. When YES started it was unimaginably incredible. Jon Anderson was wearing some sort of fur around the bottom of his bellbottoms. My eyes were fixed on them going back and forth. Rick Wakeman's solo was incredible as were Steve Howe and Chris Squire's guitar work. I couldn't see Bill Bruford very well, but he was hot. "Fragile" is the epitome of progressive rock ever. YES is still one of my top five favorite bands of all time. The experience is also one of my top four experiences of all time. On 11/21/71 Yes played my hometown of DeLand Fla. at Stetson University. The entertainment director for the University had signed them to an air-tight contract the year before so they couldn't get out of it (their price was much higher by the time the next year came around and they would have rather passed on it). The show was done on fraternity row on the Stetson Campus in a sinkhole that had a stage built in the bottom. I'm sure the road crew was grumbling over that. I was 15 at the time and had never heard them before. Some of my HS friends did know a little bit about them and talked it up. I was just getting out of a HS marching band rehearsal that went late due to the fact that it was the "homecoming" game show. The instant the rehearsal was over several of us jumped into cars and sped away to the Stetson Campus. We arrived just as the band was starting "Your Move". I have been a die-hard fan ever since. That evening they played all the expected stuff including "South Side of the Sky" (the only time I ever got to hear them play it live). Bill Bruford did a magnificent solo at the end of Perpetual Change (much better that the solo released on YesSongs), and that evening remains to this day a pivotal one for me. Their music went right through me and getting to see musicians play on that level at an early and impressionable age has left a lasting impression. They were the only band on the bill, the stage was so small Rick Wakeman was all the way off stage left on risers and completely out of the lights (with the long blond hair we thought he might be a female). The seating was on the ground, rising up like a mini-mini version of the Accroppolis in Athens. Seating was maybe 400, and people were packed in like sardines. A lot of us felt we were really a part of something special that night and with the success they've had, history has proved us correct.